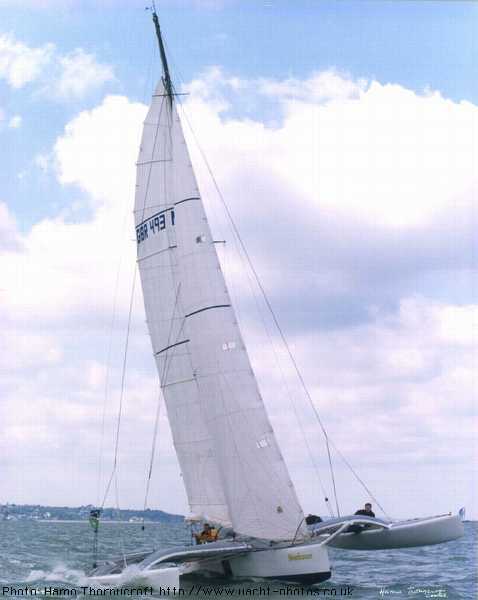 Built for John Fowler by Dave Irving at Queen Anne's Battery in Plymouth in vacuum bagged polyester and E glass, with carbon reinforcing in the main hull, Shockwave is designed to win the 30ft Class in the forthcoming Round Britain & Ireland Race. 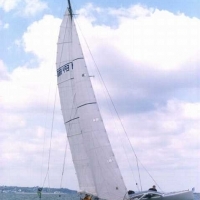 Shockwave is a development of the extremely successful Caledonia which was amateur built and sailed to a record Class VI win by my design assistant, Rod Stuart, in the 1988 C-Star. 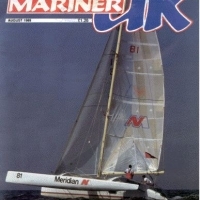 Rod's achievement of breaking the record by 6 days and 4 hours ( a similar reduction to that achieved by Philippe Poupon in the 60ft Class) and beating all the boats in Class II (50 ft ) and in Class V (35ft), was recognised by the Royal Western Yacht Club when they awarded him the Jack Odling-Smee Trophy for the competitor who most fulfilled the original spirit of the race. 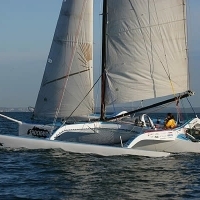 It certainly is spectacular to see the 60ft highly sponsored yachts breaking all the records, but it is no mean feat to sail a 30ft home built multihull across the Atlantic in record time, bearing in mind that the small boats have to carry much of the same weight in safety equipment, radios, etc, and twice the stores of the 60 footers. Rod later cruised Caledonia back across the Atlantic via the Azores with two friends. 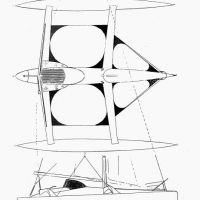 Caledonia was designed as a singlehanded windward machine. 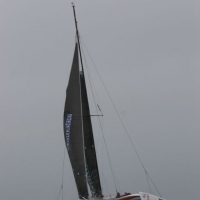 All the deck edges are well rounded and the profile of the hulls are as low as possible. Rod Stuart was lucky to lay his hands on a Harrier Jump Jet canopy for a cuddy cover which fitted in beautifully with the overall styling or the boat. 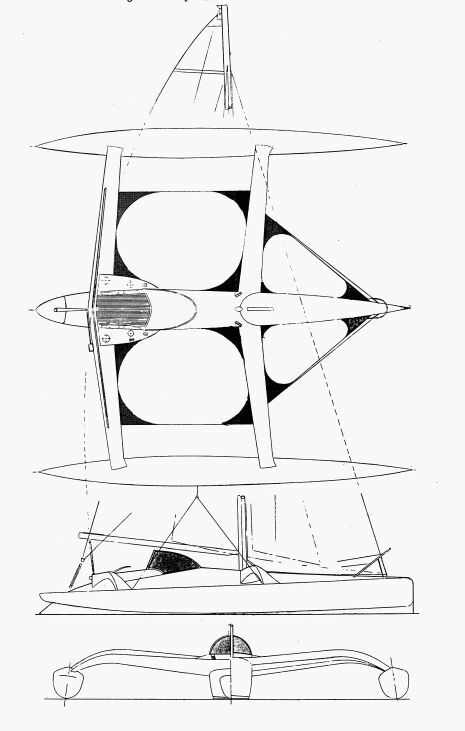 Outrigger buoyancy was fixed at 180%. 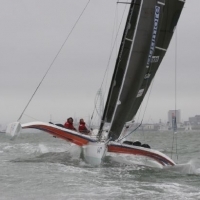 Computer modelling of the hull immersion at various angles of heel also indicated that an outward cant of 8 degrees would be optimum for average sailing conditions. 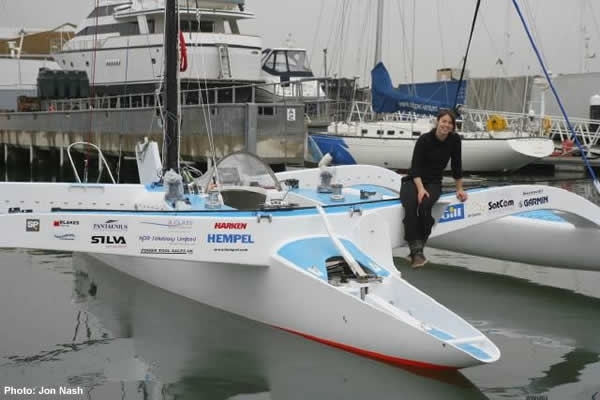 The outriggers (on which a trimaran is sailing most of the time) are the full length of the boat and the buoyancy of the immersed hull is designed to move forward as the boat heels, thereby slightly lifting the bows when sailing upwind, and damping pitching at the same time. 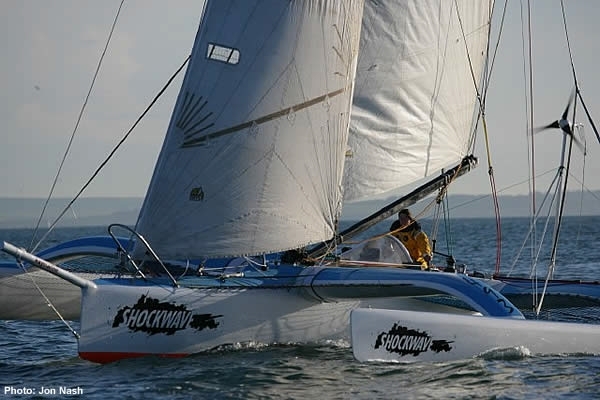 Shockwave has more buoyancy forward to give more all round power, particularly off the wind. 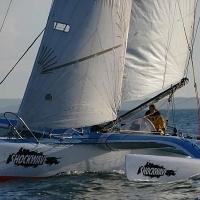 Therefore, while Caledonia was optimised for upwind sailing in the North Atlantic, Shockwave will be able to drive harder off the wind while taking a small penalty of increased windage upwind. 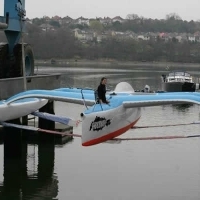 the outrigger shape is significantly different from earlier designs like Brittany Ferries GB and Fleury Michon VI, in that the rocker is reduced and the hull picks up waterline length much quicker as the boat heels. 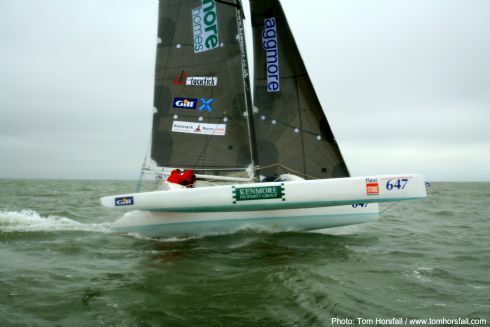 The centre of gravity of the boat is also much further aft, allowing us to design a faster hull shape for the main hull. Interior space is fairly limited in these boats and really only meets the minimum requirements of a place to eat, sleep and navigate out of the wind and weather for a crew of two. A berth is fitted under the cockpit sole and there is a second possible berth on the canvas seat in the main cabin. We have drawn a proposal for this design with a berth pod on each side of the hull. this increases the weight of the hull slightly but will provide more comfortable accommodation for someone requiring more cruising potential. 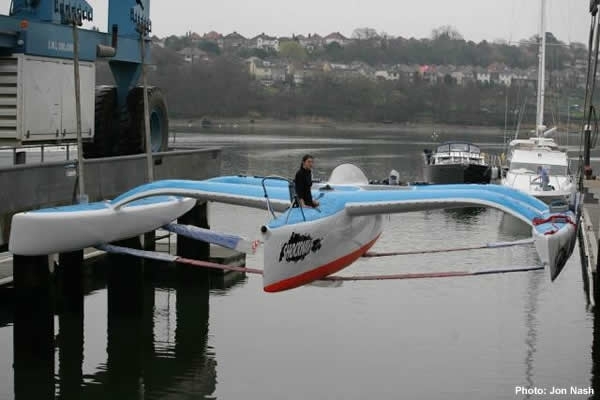 In common with many racing tris, the boat can be steered form the cockpit or by means of a tiller extension form half way out on the aft cross beam. Placing the helmsman outboard of the main hull is not only drier but the cockpit area is kept clear for round-the-buoys racing. Also, an excellent view of the sails is obtained and the weight of the helmsman contributes to the stability. The rig is as large as we felt could possibly be carried without causing too much pitching and is compensated by the 29ft beam (making the boat almost square). 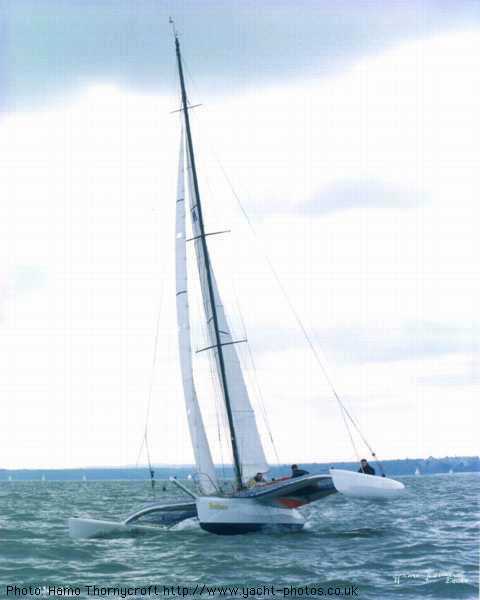 Diagonal capsize over the leeward bow is a danger if the boat is driven close to the limit, and in fact, we did bury the bows in a race in Plymouth Sound while I was on the helm (we were trying to catch a Formula 40 in 35 knots of wind). 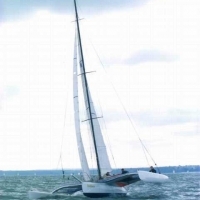 We lifted the stern completely clear of the water, but the vital fact was that the boat rose straight up and because the buoyancy in all three hulls is very similar, there was no tendency for the boat to drop diagonally onto the downwind bow of the outrigger or to slew off course. 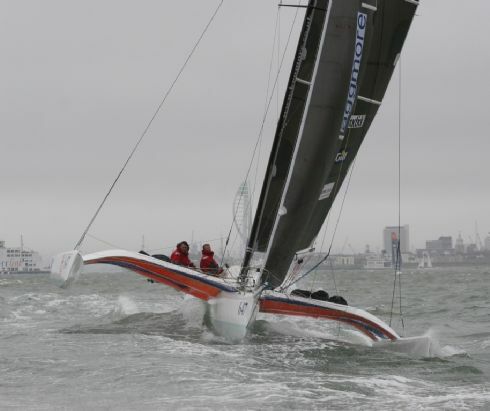 This meant that bows did not bury very deep and the braking action of the rounded decks was relatively low, allowing the boat to recover very quickly. 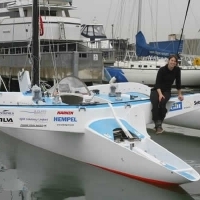 there is no doubt in my mind that three bows in line of similar volume is a good safety feature in a very wide trimaran design. 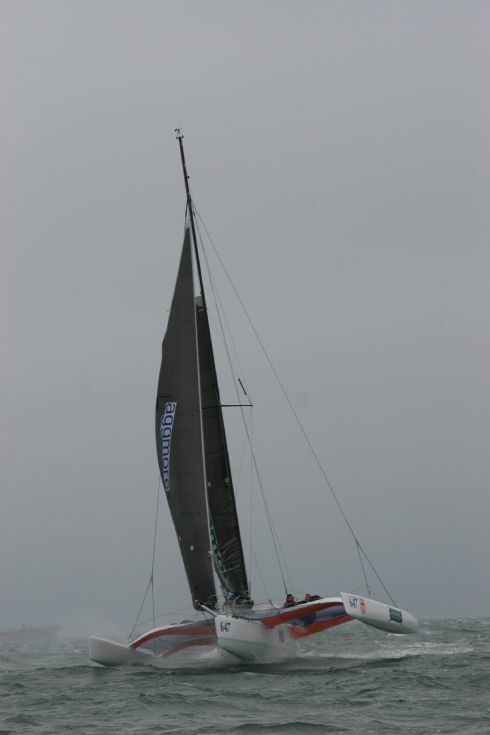 The headsail is a high aspect deck sweeping blade jib with no overlap, sheeted at 6 degrees on an athwartships track. 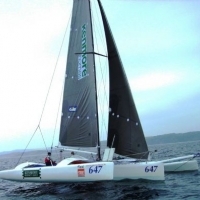 This in combination with the large, fully battened mainsail gives an upwind speed of 11.5 knots in a Force 3 tacking through 75 degrees. 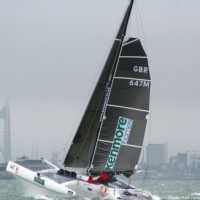 (The sort of performance you might expect from a 75ft maxi monohull.) 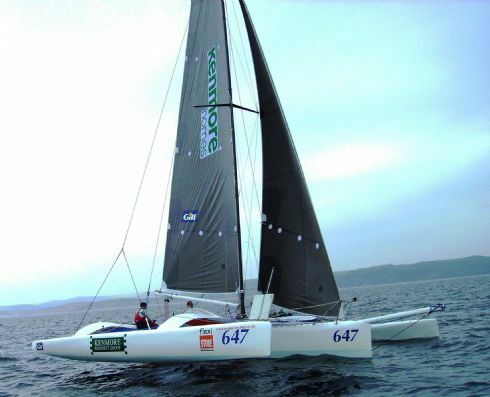 A larger overlapping mylar genoa, is available for light winds. 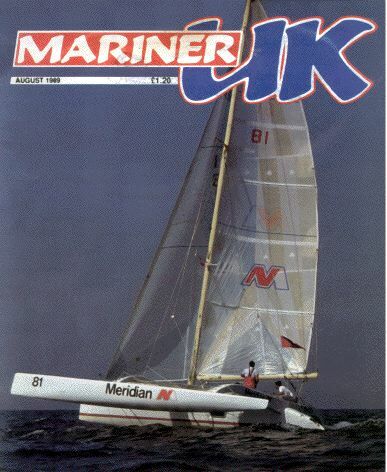 and an asymmetrical spinnaker complete the wardrobe. 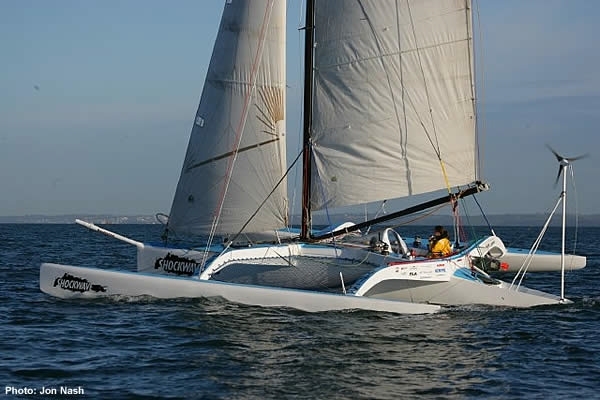 both Caledonia and Shockwave have new mainsails by Graham Goff of Technique Sails, in Kevlar/Mylar, which will give improved performance over the Terylene original used in the C-Star. 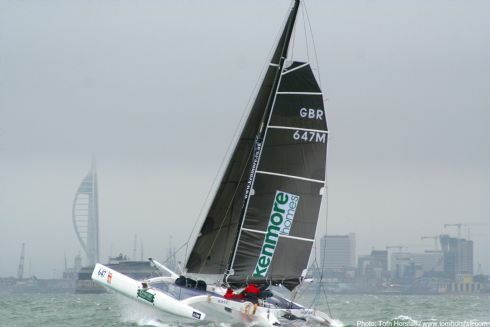 Both boats will be sailing in the Plymouth Multihull grand prix (27-29 May) as a tune-up for the Round Britain and Ireland. Tim Wilson on Caledonia ( now Meridian) and John Fowler on Shockwave are in for an interesting Race and we all wish them both the best of luck.